E-J is the proud owner and director of TipToe Music - she cannot remember life without music-making and singing! Originally from England, she has sung and performed in choirs, operas and singing groups throughout her life in the UK, Europe and Hong Kong, including The Hong Kong Bach Choir and The Cecilian Singers in Hong Kong as well as the London EC4 Choir and Dorset Opera, England. She also has flute and piano qualifications from the Royal School of Music, London, England. E-J stumbled on Music Together® when her children were small, with all three of her children sharing the Music Together experience in a Mixed Ages class in Hong Kong. This passion for encouraging the love of music with her own children inspired E-J to earn her Music Together teacher training qualifications in Melbourne, Australia in October 2013, and more recently to develop her skills further through the Music Together Certification Level One qualification in Toronto, Canada in March 2017. E-J was awarded her Music Together Certification Level I in Toronto in March 2017, having demonstrated outstanding achievement in teaching, musicianship, program philosophy, and parent education. The award was granted from the Center for Music and Young Children in Princeton, NJ, USA by Kenneth K. Guilmartin, Founder/Director. E-J has taught Music Together family classes in Hong Kong and Canada, and is also a Music Together Inschool specialist, teaching locally in daycares and pre-schools. Believing that music is an integral part of learning for all children, she enjoys supporting families and local communities to help children grow to be happy and confident through their love of music. Hiroko is a musician and teacher who loves connecting with children over music. She taught Music Together in Tokyo for three years after passing the teacher training in 2009. She also spent several very happy years at an international school in Japan as an assistant teacher, working with Nursery and Pre-kindergarten classes, singing and leading songs in the classroom. Hiroko started learning the piano at the age of four, and has been a piano player, a drummer and a percussionist ever since. At the Yamaha School of Music in Japan she studied music theory, improvisation, composition and further developed her piano skills working with a private teacher. She passed the Yamaha Piano Grade 6 level in junior high school. Hiroko is now a percussionist with the Oakville Wind Orchestra in weekly rehearsals and regular public concerts. She always looks forward to sharing her love of music with children! 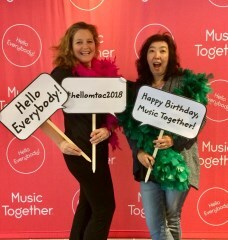 The TipToe Music Teachers having fun!